Raye Dawn Smith Forgives: "I Believe & Will Never Give Up"
23Jesus said, "If? There are no 'ifs' among believers. Anything can happen." 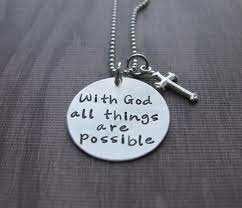 All is possible to those who believe within God, because no power can stand against God. But God alone is all-powerful. Belief will not exempt us from suffering. It will not make us popular, nor will it make our earthly life easy. At times, believers of today will be, as many were in the past, called to witness Christ by sufferings. But belief in God gives us power. Belief in God gives us life in God Himself.